So I’ve been busy knitting ALL THE THINGS – hats and cowls mainly – I have too many scarves, and no one is buying them, so why make more? 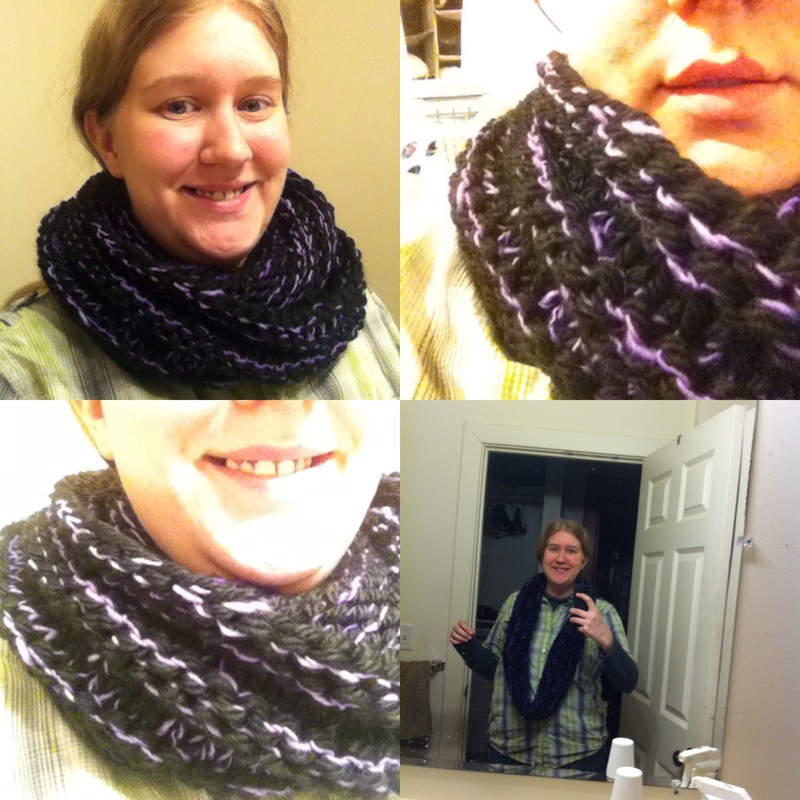 I made up my own cowl pattern, as well. First I was using one my mom gave me, but then friends told me it was too short – apparently cowls are supposed to be long? Twistable? *shrug* I don’t know. I wear them a specific way so my face stays warm outside. Most of my cowls are short, like this and this. So then I made up my own pattern so that they can be long and/or doubled up. So you use size 15 needles, circular, about 24″ long. I use a super bulky and a worsted yarn together, or two worsteds, or a super bulky by itself. Totally up to you. No guage. Cast on 85 stitches, place marker, join in the round, making sure to not twist! Depending on how much yarn you have left, you can Knit 2 rows and then bind off, or Knit 4 rows, Purl 2 then bind off. I’ve bound off on a purl row or a knit row before. Weave in ends – especially if you had to join yarns in the middle because skeins of super bulky aren’t very many yards. I usually use a Lion Brand Hometown USA along with something else – the black/purple is Hometown USA with purple hand spun, hand dyed Merino from Spun Ware over the Rainbow. The grey/grey rainbow I’m currently knitting is a Hometown USA with Vanna’s choice Patchwork grey – both acrylic. This one is all acrylic – two skeins of the same yarn. What do you like to knit?